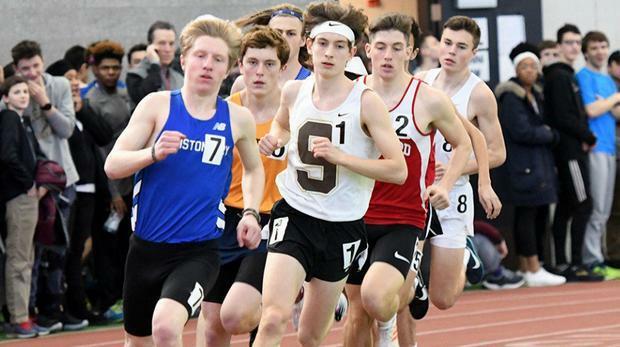 Reigning champ Miller Anderson of Hall held off Branford's Marzio Mastroianni for a repeat in the 1000m, as the Hall star was also called on to anchor his team's SMR and 4x400m teams to a 1st and 2nd on the way to the team title. Rhys Hammond of Stonington was 3rd at 2:34.36, and Michael Stamm of Northwest Catholic took 4th out of the lower-seeded first section. Mahammed Hussain of Wilbur Cross and Tobey Bill of Weston finished up 5th and 6th. Wilbur Cross's Travis Martin got a PR at 4:18.55 as he sprinted away from the field over the final two laps. Trey Cormier of Hall picked up 2nd at 4:21.34, Samuel Whittaker of East Lyme was 3rd at 4:21.63, and Azaan Dawson of Fairfield Prep, Matthew Lecky of Middletown, and Jacob Smith of Glastobury were 4th, 5th, and 6th. Connor Visnic of Amity led much of the way and seemed to have the race won coming out of the final turn, but Xavier's Robbie Cozean burst past him on the outside at the finish to win a thriller by .06 seconds. New Milford's Eli Nahom and Manchester freshman Aidan Puffer were 3rd and 4th at 9:21.98 and 9:22.63. Kabir Chavan of Ludlowe took 5th, and Hall's Trey Cormier picked up a 6th to go with his 2nd in the 1600m.